I love your comment so much. Remember the hate on the comments section had for Amanda back before we learned much more about her? The fact that you can make the comment and it not result in flurry of outrage is a testament to just how good Dave is at developing characters. Here here. And I was one of the Amanda-haters at one time. Here we get to see healing happening, and that no one is one-sided, not even bullies, but to quote Andi from way back it’s a “work in progress”. Huge kudos to Dave for making characters that are more than a 2-dimensional problem for the protagonist to get around! I hated her because she kept bullying Selkie and others, stopping with that is what made me like her, not learning more about her. I never *hated* Mandy McClelland, and I will say that Dave has shown us the Why-s of Mandy being like that. For me Mandy is a fully articulated foil for Selkie. But she is Not, nor ever will never be a Redeemed Character until she; one– apologizes to Selkie for the hurts she has caused her. And two– in some/any situation, puts Selkie’s needs or wants ahead of hers. Like a surfer-dude catching some rays, Mandy has passively allowed the love and strength of Andi and the strength and calm of Todd to relax and calm her. Basking in the hope and security provided her, but in a passive way. Until she actively and as a free agent, puts someone in her family ahead of herself I will not consider her a redeemed character. I fully and with a glad heart acknowledge the progress she has made, and offer he my encouragement. But until she shows me other than passive basking, and offers active attachment, I’m not calling her a fully redeemed character. — but hey, in this comic, Dave shows realistic growth and fully rounded characters. I mean, I can’t say that for other than about 5 other comics, out of maybe 1100 Comic’s that I have tried or followed. Right. Normally characters end up getting Flanderized. Hear hear. She’s getting better, but she still has a long way to go. I think I’d be harder on her if she was an adult. But Amanda is 8, and there’s a lot of self awareness that she doesn’t have yet. Kids are supposed to learn how to handle things appropriately from adults, and it’s clear that many of the adults in her life have failed her horribly on that front. “I should apologize” for something that’s not immediate isn’t really something I’d expect a child of her age to think of, unless prompted by an adult. Yep…she’s a Jedi all right! I am really starting to lose patience with the inability for anyone in the story to spin a tale or outright lie. Todd the answer to this is. 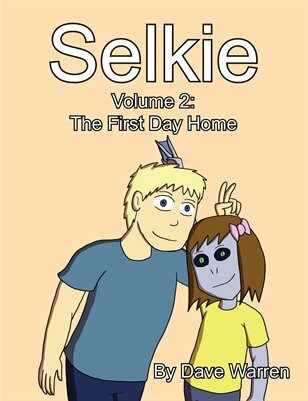 “Because the broadcast about Selkie’s home state has made everyone uneasy and the situation with Selike’s eyes would make people at the hospital nervous right now. So we’re doing her appointments as home visits” Done dusted and not even a life in the broad strokes. The world needs more honesty. Or more half-truths meant to deceive? Sounds about right. I do find it annoying when characters have trouble coming up with believable lies… but then, how easy is it to come up with a lie right on the spot, if you’re not used to lying? Being bad at lying is a character trait that I think most people have naturally — or, conversely, being good at lying is a trait/skill that only a few people actually have. Or possibly it’s lost during the transition from childhood to adulthood, as I think more kids can do it than adults can… maybe. The ability to ‘lie’ is something most adults have to do day in day out. The main lie adults have to use all the time are lies of avoidance: example being asked if you like something, but you don’t like it but you know saying so will get you in social strife. The replay here is usually “It’s a nice colour” or something else non-committal and indirect to the actual question. In the case of this very page, “The doctor wanted to do the appointments here.” That’s not even a lie but it is a dodge of the implications of the question. This is basic office 101 that Todd should have as not only a basic of office politics but an essential skill of customer facing. But putting all that aside how had Todd not by now spent some time planning his answers to stuff like this. Like spend some time standing in front of a mirror and practice you cover stories for her glowing eyes Like at this point is less ‘he’s bad at lying’ and ‘he’s completely incompetent and arguably negligent’ with his responsibility of maintaining Selkies privacy and wellbeing. This kind of questioning is not coming out of left filed he’s had days possibly weeks to get this stuff sorted out but he’s still acting like it’s all something he found out 5 minutes ago with no chance to mentally processes this stuff. The more I think about it the more it comes across as incompetence not ‘good guy can’t lie’. My concern with Todd and lying is that if he’s shown to be capable of smooth and believable fabrications, it leads more to a “person of questionable trustworthiness” character type. Usually the fictional characters who are capable of making believable outright lies aren’t the most trustworthy people. Also here he isn’t lying to a random civilian, it’s his other child. I don’t see Todd as being able to casually lie to family like that. Then there’s the whole “maybe he doesn’t want to scare his child by admitting blatantly that Selkie is an actual refugee and so is Pohl and that’s a *BIG DEAL* and I don’t know how to actually handle it” which would prove that adults are not always actually capable of handling everything and disillusion Amanda about how reliable her fairytale-come-true dad really is…. In this case it just seems unecesary because the truth – he’s teaching her how to make her eyes stop glowing – would do, I think. What’s Amanda confused about? She’s seen Selkie’s glowing eyes already. It could be explained as in-home therapy, though. That’s a thing, which involves exercises, and doesn’t need a hospital bill to do. Or because this is a Sarnoth thing and there’s now several not so secret government agencies that will be integrating Sarnothi citizens, they could just call this a govt thing instead of a hospital thing. Yeah that’s the reason I think I would have said for a not-lying no questions. It’s a racial Sarnothi thing that needs to be done in private not a human hospital. He already had Amanda meet other Sarnothi and knows she knows the term and the need for privacy. In a setting where magic is real it absolutely would be a science, imo. I really don’t see the point in Todd trying to cover any more of this stuff up. I mean, Amanda is part of their life now, she’s going to learn about this all one way or another. On top of that, Selkie’s people already hijacked cable TV and made their presence known, so it’s not really that much of a secret now, they are even making attempts at integrating more students into classes. Didn’t a previous comic even say they were going to have a speaker show up or something? I don’t know if this is just Dave trying to make Amand look sharp, or if Todd is just a dummy, but this whole cover-up things really seems to make no sense at this point. Okay on one point Amanda’s pretty quick to understand what this is. But on the other hand this doesn’t sound unlike anything doctor’s tell their patients. It kinda reminds me of therapy. But they really should tell Amanda what’s up. It kinda seems silly to keep lying to her when she already knows Selkie’s not human. I wonder if Todd is not sure how Amanda would react to basically hearing “Selkie has superpowers and we need to teach her how to control them.” He is still trying to wrap his head around that and may need to come to terms with it himself before explaining it to Amanda. Also, Amanda and Selkie are finally getting along decently well and there have been a lot of recent major chances in Amanda’s life. Todd many not want to introduce yet ANOTHER new thing to her, especially since it might jeopardize her now-decent relationship with Selkie. Who knows if Amanda might get jealous or even feel afraid of Selkie’s powers if that info was dumped on her right now? I also wonder if Todd had a knee-jerk awkward reaction when Amanda said, “That sounds more like training…” It would probably NOT be good if a rumour got out that refugee Sarnothi are being trained as warriors (it also probably doesn’t help that Selkie keeps making all those hilarious “Star Wars” references! ).